Yes, I know!! ANOTHER FLOWER TUTORIAL!! BUT, if people want to see how they are made, they ask. And if they ask, I make the tutorial. And lets face it, you can never have enough beautiful flowers!! Ive been asked to do a tutorial on the lace flowers I showed in a previous post. These are very quick and easy and they can look however you want. I was taught to make a lot of flowers when I was in Primary 4, from my lovely Primary School Teacher and this running stitch flower is just one of the things she taught us. Big, small, single layered, double layered, pink, blue, green, frilly, flat, gathered......whatever you want, you can have with these flowers. They are so pretty with different layers and make any project look amazing. Flowers are becoming very big again, especially in Fashion and I'm seeing them back on headbands, dresses, tops, hats....you name it....flowers are back in. All you need is a needle and thread, some lace and whatever embellishments if you want them, for example buttons for the flower centres. Please also excuse my mucky, inked and glued hands in the photos!! Its the risk we take to make pretty things!! You dont need much for this tutorial. Pick whichever lace you want to work with. Obviously the thicker the lace, the bigger the flower. 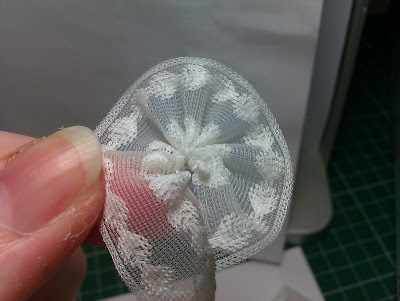 Im using a pretty narrow lace so this will make wee flowers, perfect for cards. 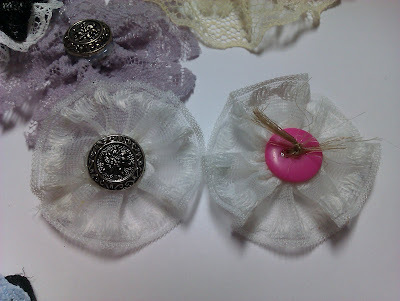 Whatever embellishments you would like......button in the centre, pearls or bling....or just plain and simple. I havent told you a length of lace and there is a very good reason for this. And its simply.....I dont know how much I need until I start stitching!! So dont cut your lace, just start at the end and place your needle as close to the edge as possible. The reason for this is because this edge will be your centre. 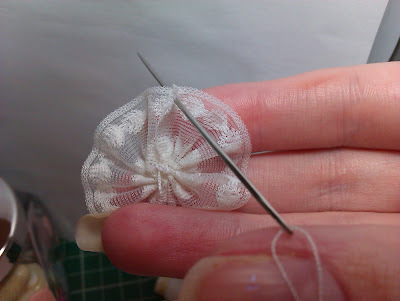 And if you start to sew in from the edge, the centre of your flower will have a lot of extra material in the middle that is wasted when it could have been forming your flower. Do a simple running stitch along the edge of the lace. See photos 1 and 2. 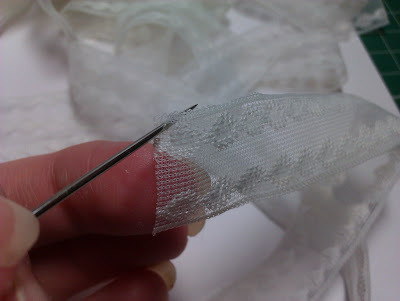 As you are sewing your running stitch you will start to see your flower forming, see photo 3. 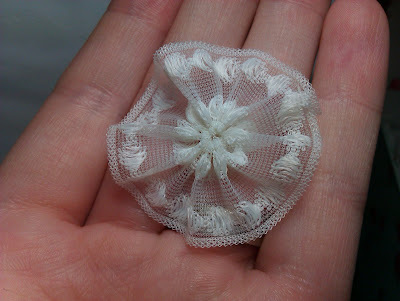 However if you look at photo 3 you will see the flower still doesnt have much body or ruffles and is still quite flat. 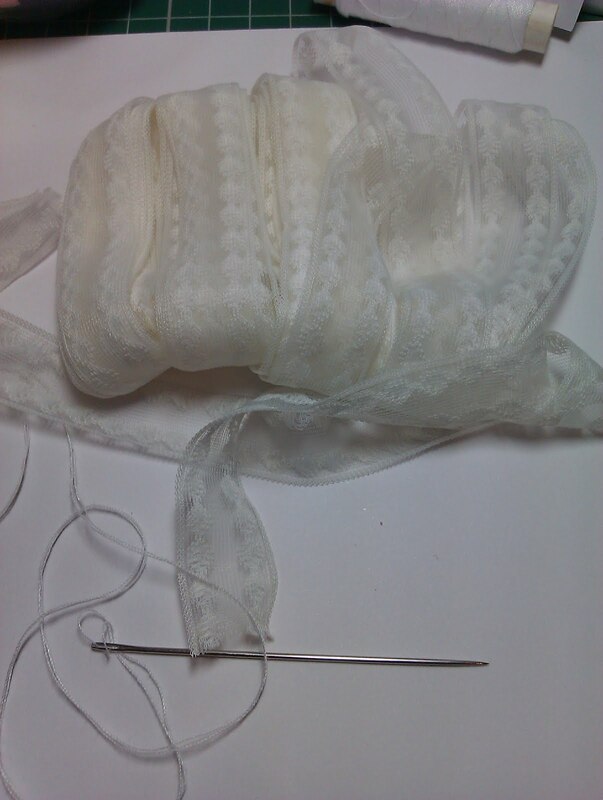 This is how you know to sew on a bit more.......but not too much as you are almost there. 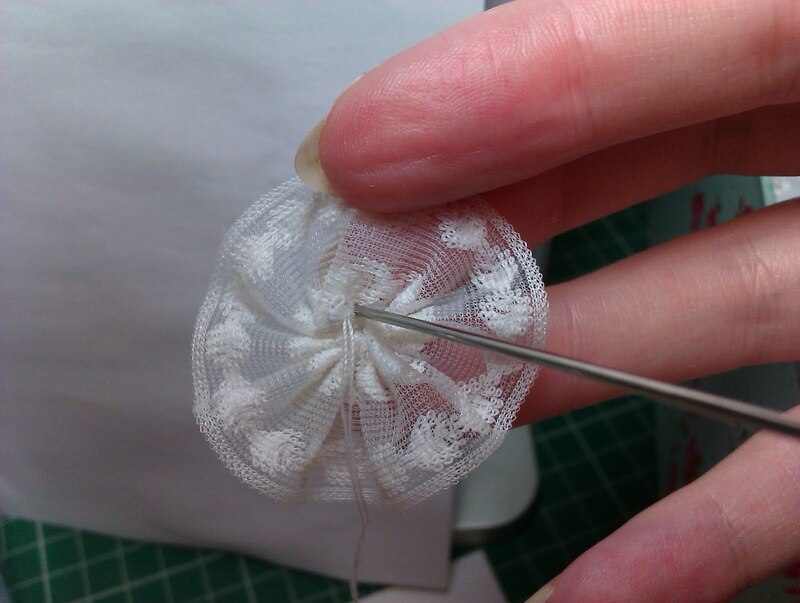 You will know if you've done too many stitches as the flower will start to almost overlap on itself. When you have done enough stitches and you are happy with how it looks you need to cut you lace. MAKE SURE you cut the lace just a wee smidgen after the last stitch as you want your needle and thread still attached to your flower. See photo 4. 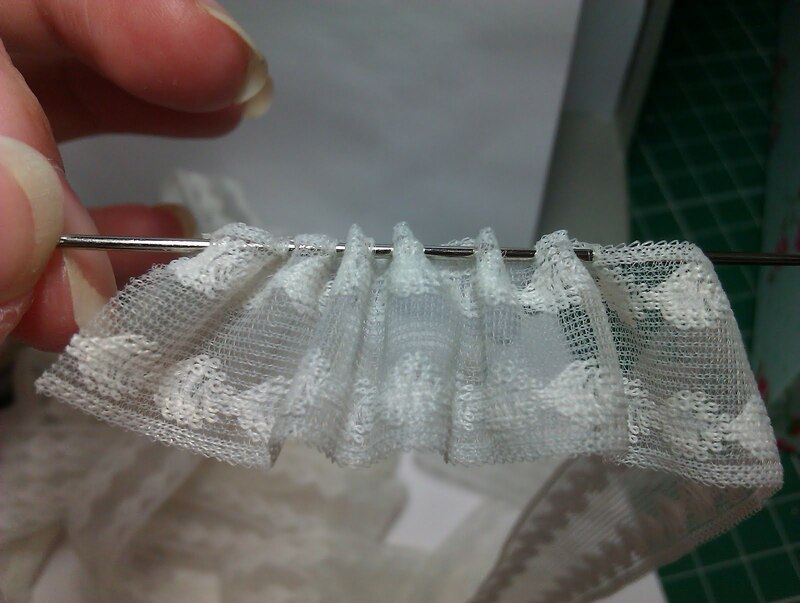 Now what you need to do is gather the lace together on the thread to ruffle it. Bring the two raw edges together and slightly overlap. 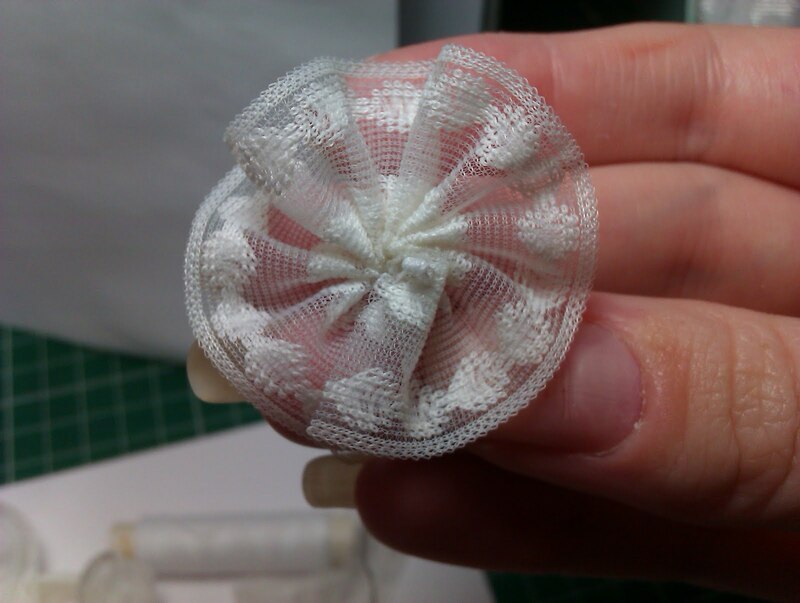 At the centre of the flower put a few closely stitches stitches through both overlapped pieces and secure a knot. See photo 5. 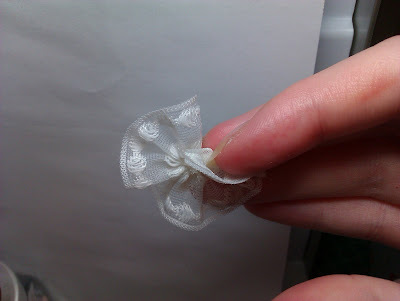 Cut the thread free as close to the centre knot as possible. Now at this stage you may leave the flower like this. However as you can see from photo 6 above, there is a raw edge on the outside of the flower. Now the material has been overlapped slightly so you may never notice this raw edge, but I personally dont like to leave it like this. 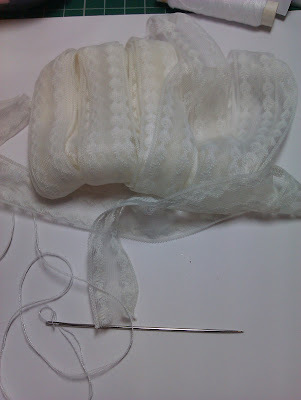 I use my needle and thread and just put a tiny securing stitch near the edge to secure both sides. You wont see the stitch its that small. See photo 7. And that is it as far as the basic flower is concerned. See photo 8. Now the fun begins and you can add whatever you want to your flower. As you can see from the photos below I have used buttons which I glued on with my hot glue gun. Some have wee sparkly bling gems. Its up to you. You can then think about different colours and layers. 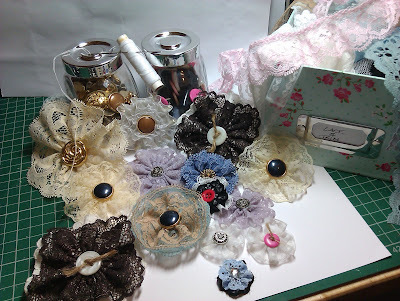 To do multiple layered flowers like those in the photos below, simply add another contrasting coloured ribbon and sew these together, one on top of the other with your running stitch. Its a nice touch if one is wider than the other. These also look amazing with feathers behind them with some stringed pearls and stick pins, they look beautiful on cards or tags. Just have fun, experiment and see what you come up with. 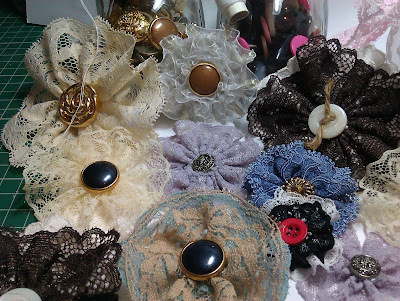 Next stop....fabric flowers!! Thanks so much Lee, such a clear and well explained tutorial. 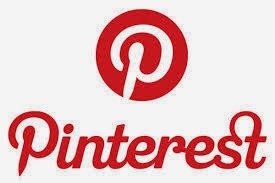 They look so pretty - i will definitely be giving these a try so you might see them on my cards soon!!? thanks for this lee. have you tried it with the crochet lace or just the fine lace? ad do you have to glue the buttons etc on or can you sew them on? Ooh! some more gorgeous flowers Lee, I will be trying these, thanks for a fab tut hun. Gorgeous flowers and a great tutorial, must give these a try, well done. 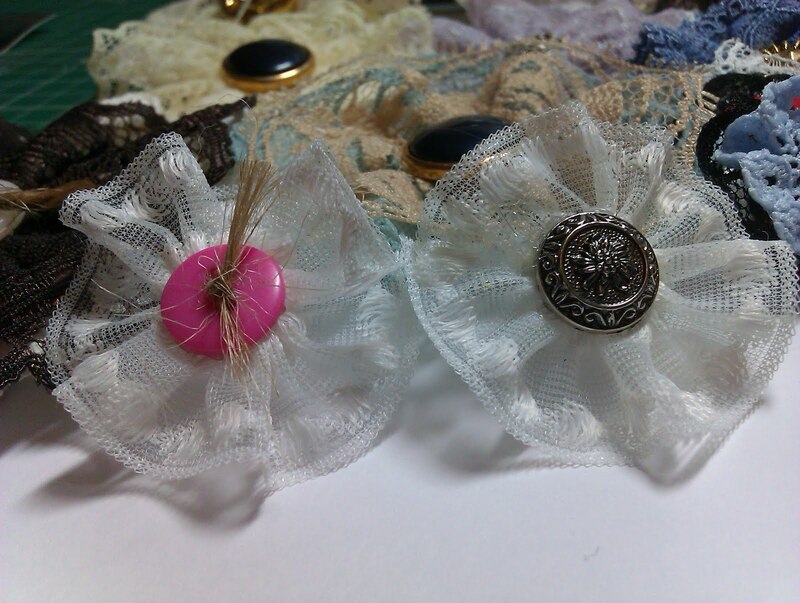 Lovely flowers - I remember making something like the lacy ones when I was at school but had completely forgotten. I'd love to see them on one of your cards too!